There we were, sitting around the Calcbench research offices, still marveling at Chicken Soup for the Soul Entertainment’s bargain purchase of a streaming media company — the subject of our last post, where we explored how Chicken Soup turned a $5.3 million purchase into a $24.3 million one-time boost to the income statement. How many other bargains are out there, we wondered? What could we find? So we decided to flex our Calcbench database superpowers and take a look. The mechanics of this exercise are not hard. 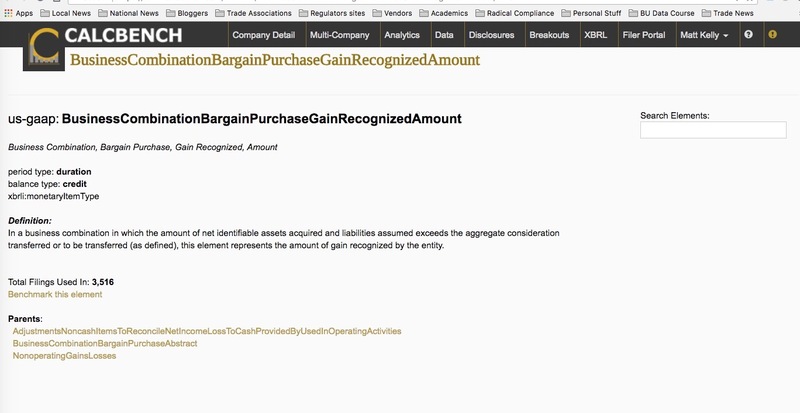 First we returned to Chicken Soup’s disclosure about its one-time “gain on bargain purchase.” We clicked on the number itself ($24,321,747) to use our Trace feature — which showed us the XBRL tag that Chicken Soup used to identify that value as a “BusinessCombinationBargainPurchase.” See Figure 1, below. 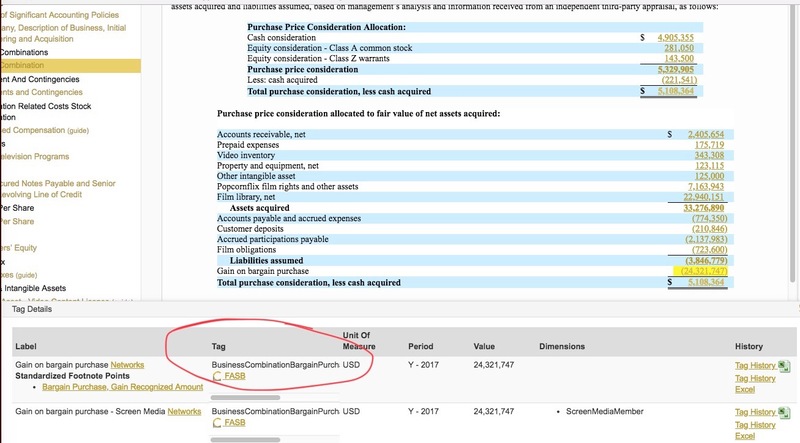 Click on the result in the Tag column (circled in red in Figure 1) and that will take you to a new page that shows you everything you want to know about that tag. Including a heading called “Benchmark This Element.” See Figure 2, below. 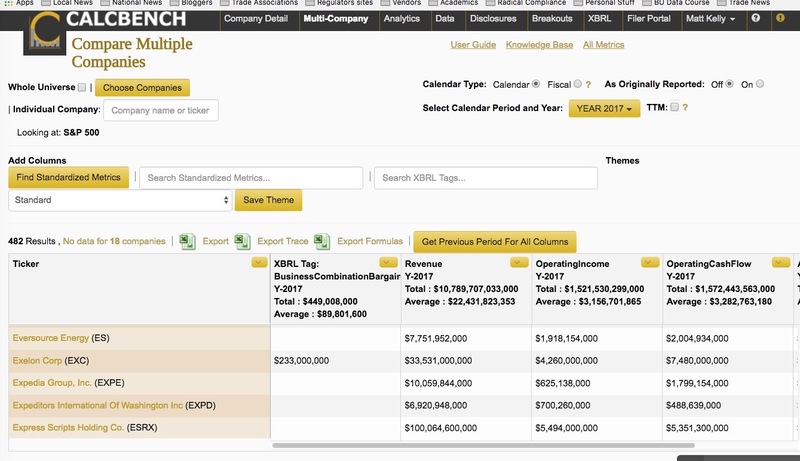 That heading tells us that 3,516 filers used this tag in 2017 — so while not every filer might have a bargain purchase gain as large as Chicken Soup’s, lots of companies do report some type of gain on purchase. Which ones? If you click on that “benchmark this element” link, Calcbench whisks you away to yet another page — where we list all the filers that use that element! Our default setting is to show you results within the S&P 500, for the most recent calendar year. You can change those setting to different peer groups or to other filing periods, using the controls along the top of the page. See Figure 3, below. Again, click on that number and you can use our Trace feature to go back to the source document that produced it. We did, and found that in 2017 Exelon — a power generation company — spent $289 million ($235 million in cash and another $54 million worth of nuclear fuel) to acquire a nuclear power facility in upstate New York from Entergy. The fair value of that facility included $1.28 billion in assets and $757 million in liabilities, which is a net gain of $522 million. In other words, Exelon paid $289 million in cash and nuclear fuel to put $522 million worth of assets on the balance sheet — which is a difference of $233 million. That’s the bargain gain. And that’s how you can find them if you want to traipse through the data in Calcbench.